The Samford University women's track and field team collected its third straight Southern Conference Indoor Championship title Feb. 25 as the Bulldogs registered 161 total points en route to an 11-point margin of victory over second-place Western Carolina (150) at the VMI Corps Physical Training Facility on the campus of the Virginia Military Institute. Samford's men also turned in a record-setting performance at the 2018 SoCon Indoor Championships. The Bulldogs placed second in the event for a third straight season and moved one step closer to upending the Catamounts for the annual indoor title. Western Carolina's men won their fifth consecutive title and Samford's women claimed their third straight as the SoCon Indoor Track and Field Championships came to an end. Four championship records were either matched or toppled on the day. Both team titles were hotly contested. The Catamount men, who trailed the Bulldogs by seven points entering the day, edged Samford by just three points, 141-138. The Bulldog women returned the favor with a close win of their own, a 161-150 victory over runner-up Western Carolina. ETSU's men finished third with 111 points, followed by Furman (92), The Citadel (66), Wofford (62), VMI (48) and UNCG (four). On the women's side, Furman was third with 107 points, with ETSU (103), Wofford (67), VMI (48), The Citadel (16), Chattanooga (six) and UNCG (four) rounding out the standings. With every event but the men's pole vault in the books, Western Carolina led Samford 138-114. The Bulldogs made it interesting with a podium sweep – highlighted by Tray Oates becoming the only four-time indoor pole vault champion in SoCon history – but the Bulldogs' 24 points in the event were offset by the three decisive points Western Carolina's Corey Ginley earned with his sixth-place finish. On the women's side, Samford opened the day with a 37-point lead but saw it shrink to two (119.5-117.5) with Western Carolina's Ty-Leah Hampton's win in the 200-meter dash. Camille Caldwell's win in the weight throw gave Samford some breathing room again, and Selena Popp's high-jump win and the Bulldogs' runner-up finish in the 4x400-meter relay was enough to offset the Catamounts' relay win. 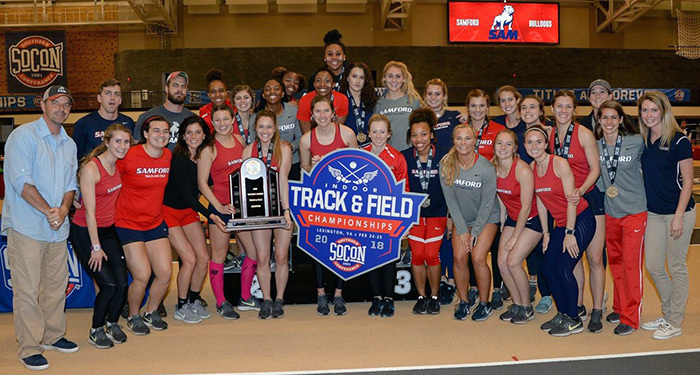 Samford swept the Most Outstanding Athlete honors, with Popp winning on the women's side after wins in the pentathlon, high jump and long jump and Marquis Barnes winning the Heath Whittle Award on the men's side after victories in the heptathlon and long jump. Samford's Rachel Dixon won the SoCon's Pinnacle Award for owning the highest grade-point average on the championship team. For results, schedule updates, breaking news and links to all of your favorite articles featuring the Bulldogs, please follow @Samford_Sports on Twitter.